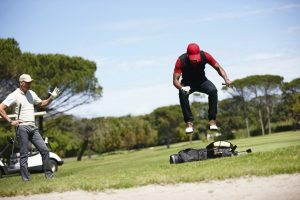 There are a lot of simple ways to help keep your favorite golf course up to standards without becoming a groundskeeper. Most of it is just common courtesy that you would practice at any public establishment. These aren’t just golf-centric practices, but things you should be practicing no matter where you are. Some people like to eat or drink on the course, and that’s fine. However, once you’re done with your indulgences, simply throw away your trash. Help out by picking up anything else you see on the course that shouldn’t be there either. Also, fix your divots. If your shot is a little fat and you take some of the turf with you, take some time to repair it. It’s the most common courtesy of the golf world. It’s common sense, but it still happens at golf courses and other public establishments all over the world. Golf is a gentleman’s game, so there are certain standards that should be met. It is incredibly frustrating to be focusing hard on a shot, just to have it ruined by yelling and hollering by the party coming up behind you. If you’re using a golf cart, don’t drag race them with your friends. Drive carefully and watch out for other people. Be courteous to others and follow basic golf etiquette. Don’t ruin the reputation of the course. Golf courses are made up a lot of land, so there might be some things that go unnoticed by the staff. If you see something that you think shouldn’t be there or needs to be fixed, let the staff know. You wouldn’t want to step into a bunker a find it’s full of quick sand, so don’t let it happen to the person after you. The grounds crew of the course may like things done a certain way. I’m sure they would appreciate any help you would give them, but check in with them before you do anything. The last thing they want to happen is a part of the course being ruined because an overeager golfer tries to fix something themselves. Most of these are self-explanatory, but it’s good to get a reminder every now and again. I’m sure your favorite course and your fellow golfers will appreciate you and follow your lead if you just follow these things, along with basic golf etiquette.